Available in 8 options/colors – Gold Ivory Clear, Silver Crystal – No Pearl, Silver Ivory Pearl with Clear crystals, Silver White Pearl with Clear crystals, Silver White Pearl with Pink Accent crystals, Silver White Pearl with Light Amethyst Accent crystals, Silver White Pearl with Light Blue Accent crystals and Silver White Pearl with Red Accent crystals. Sweetly floral and precious, the Lovely Crystal & Pearl Floral Tiara dazzles with marquise-cut rhinestones, faux pearl flowers, and a simple curl pattern made out of stunning clear princess-cut rhinestones. 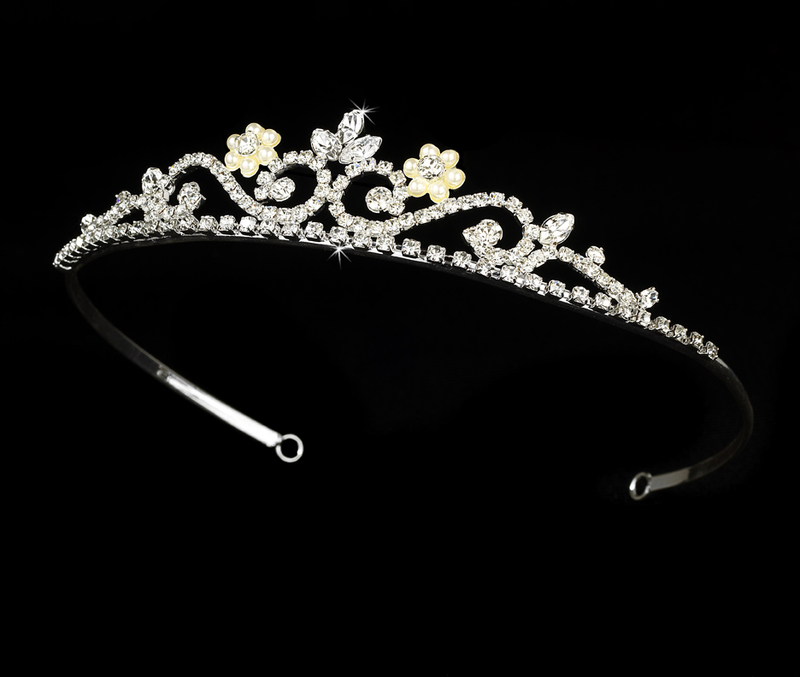 This floral tiara is very versatile. 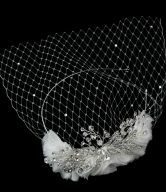 It’s the perfect bride’s, bridesmaid’s, or flower girl’s accessory to your classic or modern wedding. 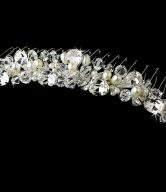 It will also make an amazing hair accessory for a prom, homecoming or even a sweet sixteen! 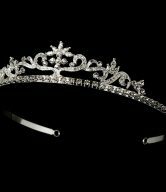 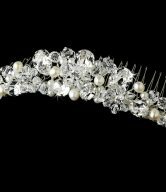 The ornamented portion of the Lovely Crystal & Pearl Floral Tiara measures 6-1/4″ wide and 1″ tall, and the piece ends in two loops on each side that allow you to fasten it securely into the hair with bobby pins. 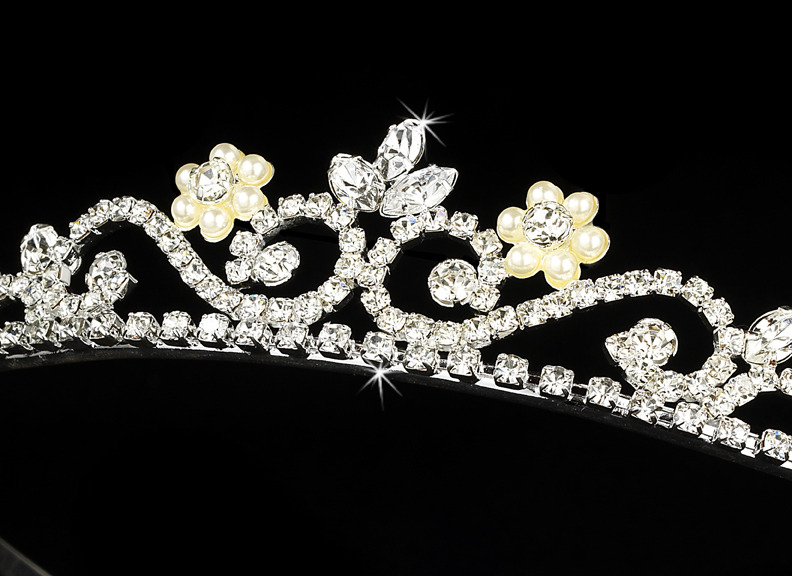 It comes available in 8 different options/colors – Gold Ivory Clear, Silver Crystal – No Pearl, Silver Ivory Pearl with Clear crystals, Silver White Pearl with Clear crystals, Silver White Pearl with Pink Accent crystals, Silver White Pearl with Light Amethyst Accent crystals, Silver White Pearl with Light Blue Accent crystals and Silver White Pearl with Red Accent crystals.